An extremely cold hardy perennial native to Europe and Asia. Its medicinal value has been recognized since ancient times! 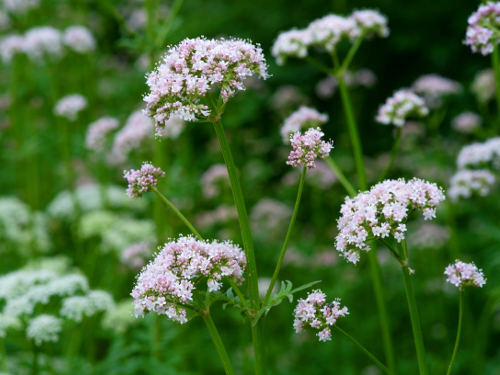 Its roots are used as a sedative and can help with anxiety, nervousness and insomnia; can also be used to relax tense muscles and soothe digestive discomfort. Adding a root infusion to your bedtime routine, can help you to wind down and get a good nights sleep. Can also be made into a tincture. In contrast to its fragrant inflorescences, beware of the roots unpleasant odor; best to store in an airtight container after drying. Roots can be harvested within 1-2 years of planting. Interestingly enough, some say cats love them even more than catnip! Easy to dry in an oven. Plant must be be cut back every so often to keep it from becoming invasive. Will self seed, so snip flowers before this happens to control spreading. Plant in full sun to part shade. Thrives in well-drained soil rich in organic matter. Ht 3 feet.